serpentwithfeet is an avant-garde vocalist and performance artist whose growing body of work is rooted in dueling obsessions with the ephemeral and the everlasting – key components of his artistic journey from a childhood stint as a choirboy in Baltimore through his time at The University of the Arts in Philadelphia, where he studied vocal performance before relocating to New York City. His forthcoming debut full-length album soil is a return to the sensibilities and wide-eyed curiosity of his musical youth before symmetry and sterile soundscapes ruled the roost. With the release of soil the chameleonic serpentwithfeet (born Josiah Wise) rediscovers and ultimately returns to the unhinged version of himself he was sure he had outgrown. 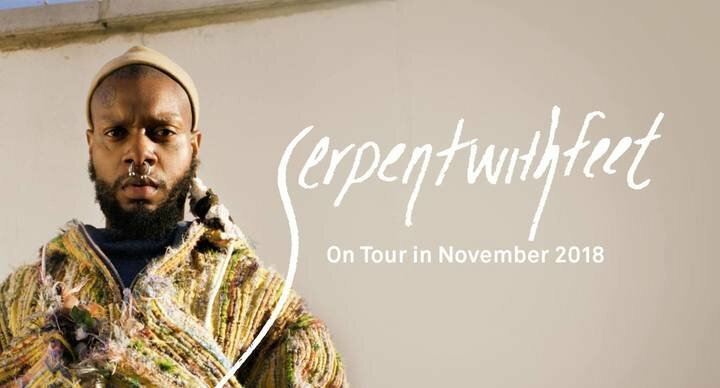 Following the release of Blisters – his 2016 foray into hybridized pop produced by Björk collaborator The Haxan Cloak – and two big tours, serpentwithfeet returned to the studio in 2017. There, he explored the fullness of his voice and became increasingly interested in playful singing which intrigued recording engineer Jason Agel. That vocal performance was only complicated by his feverish rumination on the dissolution of an impassioned love affair that left him stunned and speeding toward the inevitable – a more intimate relationship with himself. One in which he embraces and mocks his own flaws with abandon, lets an uncharacteristic shock of hair down over his infamously provocative forehead tattoos, makes room for his most pressing sexual desires and returns to the gospel that dominated his formative years. In this embrace of imperfection and romantic failure, serpentwithfeet has found soil; the forthcoming album is his first release for the label partnership between Tri Angle Records and Secretly Canadian.